Vangrace Compassion Ministries (VCM) - Orphanage at God's Village Bujjako Island in Buwama Sub-county . It was Established in 2003 with 15 orphans and currently supporting 279 Orphans and Vulnerable Children who don't have parents , abandoned, loitering around the streets. Some of these children whose parents came as refugees from Rwanda and Democratic Republic of Congo to Uganda and later died and their children where left out. (a) Providing the basic physical necessities; (b) providing spiritual, mental and emotional well-being; and (c) Providing assistance towards greater self-reliance. Vangrace Compassion Ministries (VCM) Educational Programs. Providing education to more 280 Orphans and Vulnerable Children in Uganda from Nursery through Primary (Junior) . We are committed to helping as many children as possible to achieve their dreams. Our Education Program aims to equip children for brightest future to Minister to their Uganda Communities as well as as Africa in General. We promote primary education for the orphans, vulnerable and abandoned children and we also support them with scholastic materials like books, pencils, and pens. Our education services provide skills and knowledge that will last a life time. Due to poor medical facilities, many of our orphans have been attacked by different kinds of diseases like chicken pox, jiggers, typhoid and malaria. Your support towards medication facilities is warmly welcomed. We provide shelter to the total orphans and homeless children but due the high number of the children than the facilities, the shelter conditions are poor. The children lack mattresses, mosquito nets and blankets. This has resulted into poor health conditions. 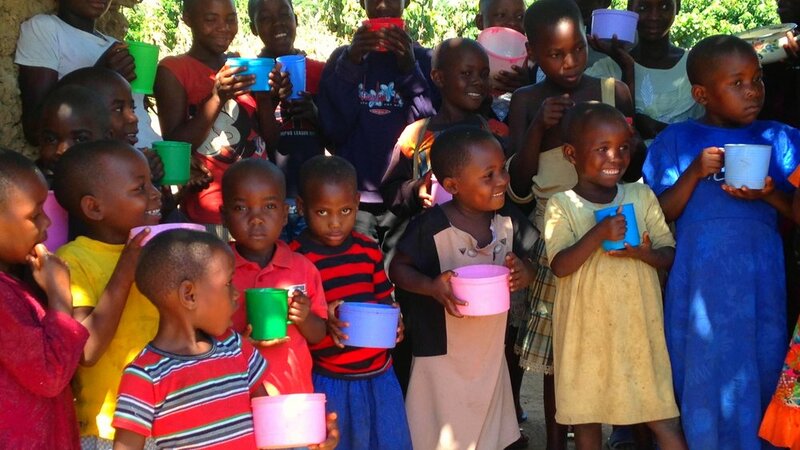 Vangrace Compassion Orphanage provides daily nutritional meals twice for the orphans, vulnerable and abandoned children. The orphanage also has a garden which helps to sustain this vital feeding program, which has helped to improve the concentration, stamina and general health of the vulnerable children. Apart from educational services rendered to the vulnerable children, Vangrace Compassion Orphanage also provides accessibility of sports to these children. Sports like football, pool table and wooden bicycle riding are available to the children. Tertiary skills like art work, necklace making, carpentry and mat making are also taught to these children so as to promote their talents and also to brighten their future. To Sponsor a Child send email to orphancare@vangracecompassion.net with the Name of the Child you selected from those photos aside. You can Make a difference in the Life of an Orphan through your Individual child sponsorship. Sponsors Receive Regular Updates and photos of their sponsor Children and get to see first hand Difference they are Making. Vangrace Compassion Ministries serves the orphans and vulnerable children by providing food, medication, education and shelter to these less fortunate children. Not only does Vangrace Compassion Ministries provide material, physical needs to these children, we raise up children on God fearing- based foundation. With that we believe sponsoring one or two of these children can be of great support towards VCM fulfilling the above service to these children as seen besides in photos. One Of Our Mission Is To Produce Sound Morally And Self-Reliant Citizens Through Provision Of A High And Good Standard Practical Education For The Orphans, VCM Set Up A Primary School Which Is Currently Providing Good Quality Education To The Orphans. The God's Village school is currently in temporary and not so good wooden structures that are always destroyed by termites and some rodents. There is currently a total staff of six teachers and 279 pupils that’s a ratio of approximately 1:39 respectively which is high for the pupils. pupils study under trees as the wooden structures cann't serve all; this disturbs children during harsh weather conditions like too much sunshine and rainfall. Absence of learning materials like charts, textbooks, Exercise books and many others stationery is also another great Challenge. Currently VCM has embarked on a plan to construct Permanent Classrooms and staffstructures with its major success being registered in making of 10000 Bricks and designing an architectural School Plan and impressions. We need a total amount of $84,618 for this project to proceed. establishing an Art and Craft Class Session for Paper African Necklaces to Generate income to support the Organization though now in search for the market. You can become part of this wonderful ministry as you support school building and reconstruction by donating whichever thing that you know can be used in this school building project / education. You can donate stationery like books, crayons, pens, pencils, rulers, colored pencils, books, Textbooks, chairs, Desks the list is endless but just your Donations are highly needed. Joy as We Received 700 Mosquito Nets Donated By A 15 Years Old Girl.